M Biarnes-Pelicot, P Bongrand, P Robert, O Theodoly. Collaboration with J Bico, ESPCI-Paris; JM Forel, L Papazian AP-HM. Several characteristics of the blood microvasculature make it a special location for pathological events. First, capillaries are remarkably small as compared to cells in the blood stream, i.e. blood cells or cancer circulating cells, which have a typical size of approximately 10 µm. Circulating cells must therefore strongly deform to pass through the microvasculature, which puts their mechanical properties to the test. Second, trafficking cells in capillaries are in close contact with the microvascular endothelium during their passage, which favors cell-endothelium interaction and potentially adhesion. Third, the hydrodynamic shear stress in the bloodstream reaches its highest values in arterioles and capillaries, applying important stresses on endothelial and arrested cells, like immune cells or pathogens. Last, the intimate contact between the microvasculature and surrounding organ tissues favors the sensitivity of immune cells to inflammatory signals and the extravasation of immune cells toward inflammatory zones. This set of characteristics explains why certain pathological events occur specifically in the blood microcirculation. Figure 1 : A microfluidic sorter of blood cells by stiffness. A-Picture of the microfluidic device B- Sketch of the simple system of injection using standard hospital tools C- zoom on the microfluidic gradual filter where stiff cells (red) are separated from soft cells (green) by a flow from left to right. Microfluidic tools have been developed in LAI since 2007 to explore the passage of circulating leukocytes through narrow constrictions mimicking lung blood capillaries. We could reveal the importance of actin cytoskeleton organization on the rheological properties of leukocytes and hence on the time required to cross the microvasculature (Biophysical Journal 2009). A microfluidic device was then designed to achieve the first microfluidic rheometer yielding quantitative absolute measurements of cells loss modulus or apparent viscosity (Biomicrofluidics 2013). A microfluidic diagnostic tool was also build and tested at hospital to assess stiffening of leukocytes in whole blood samples (Lab Chip 2013). Finally, an in depth medical study of adhesiveness and stiffness of leukocytes using serum samples of ARDS patients allowed identification of cytokines triggering a massive arrest of leukocytes in the lung upon early ARDS (Critical Care 2016). Figure 2 : A microfluidic rheometer for medical investigation. A- Sketch of a microfluidic constriction allowing a quantitative measurement of cell rheological properties (the loss modulus) B,C- Image sequences showing the passage of leukocytes incubated in sera of a sane volunteer (B) and a ARDS patient (C), exemplifying the strong stiffening effect of ARDS patient sera. In leaving the blood stream for lymph nodes or sites of inflammation, T lymphocytes are captured by the endothelium and migrate along the vascular wall to permissive sites of transmigration. These processes take place under the influence of hemodynamic shear stress and we investigated here how migrational speed and directionality are influenced by variations in shear stress. Naive and effector T lymphocytes and neutrophils, have been examined on ICAM-1 coated surfaces under the influence of shear stresses from 2 to 60 dyn.cm-2. We found that the speed of both T lymphocytes and neutrophils was shear stress independent. However, the entire T lymphocyte population responded to shear stress by a rapid (30 s) and fully reversible orientation of their migration against the direction of fluid flow, while the population of neutrophils and leukemic HSB2 T lymphocytes oriented their migration with the direction of fluid flow. These results suggest that there exist fundamental differences in the migratory mechanisms of the different classes of leucocytes responsible for the innate and adaptive immune response. Our findings also suggest that abnormal vascular architecture or certain leukocyte malignancies could contribute to the dysregulation of the extravasation process. Figure 3 : Effector T lymphocyte crawl against a flow. A- Image of a lymphocyte crawling against a flow of 8 dyn/cm2. The yellow arrow shows flow direction. B- Mean square displacement of cells versus time in absence (yellow) and presence (blue) of flow, showing a clear transition between diffusive and ballistic motions. A wide variety of cells migrate directionally in response to chemical or mechanical cues, however the exact mechanisms involved in cue detection and translation into directed movement are still debatable. Figure 4 : Lymphocytes tails (or uropods) are the steering device of lymphocytes. A- Confocal microscopy image of a T lymphocyte (green-membrane, blue-nucleus) with a 12 µm diameter magnetic bead (red) attached to its tail. 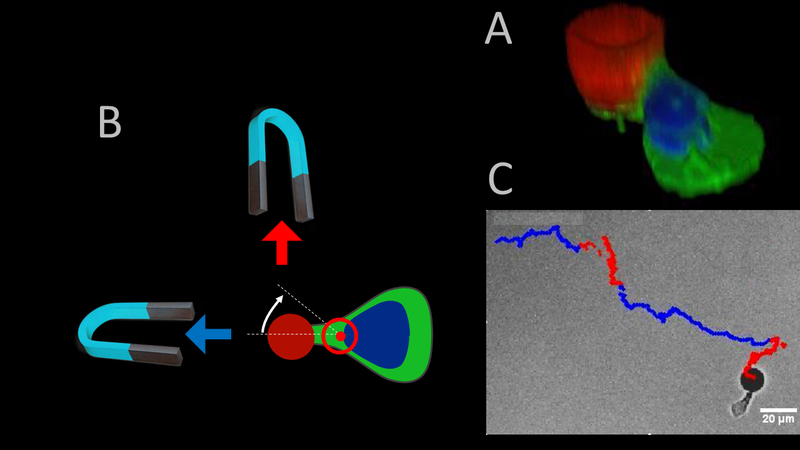 B,C- The magnetic bead allowed us to actuate cells’ tail with magnetic tweezers (B) and to pilot the cell on a targeted path, here a series of horizontal (blue) and vertical (red) steps (C). We have recently shown that cells’ tails, called uropods, act as microscopic wind vanes that transmit detection of flow direction into cell steering via the on-going machinery of polarity maintenance, without need for novel internal guidance signalling triggered by flow. Contrary to chemotaxis, which implies active regulation of cue-dependant signalling, upstream flow mechanotaxis of lymphocytes may only rely on a passive self-steering mechanism. 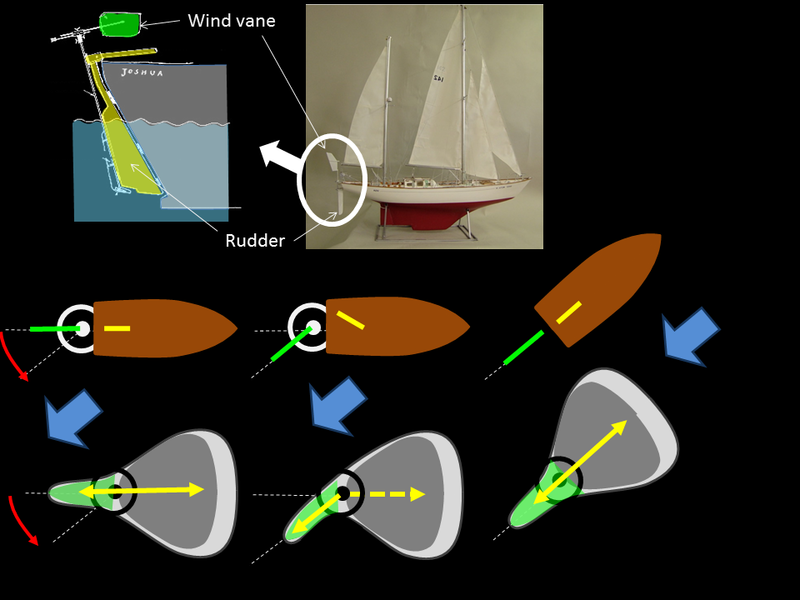 Figure 5 : A wind vane self-steering system. The actuation of the cell’s tail direction by flow is similar to a wind vane actuation by a breeze. The direction of the tail direction coupled to the ongoing maintenance of cell polarity induces cell turning. This mechanism is reminiscent of mechanical self-steering system used on sailing boats. M Biarnes-Pelicot, C Mionnet, P Robert, O Theodoly, D Touchard, MP Valignat. Collaboration with M Bajenof, JP Gorvel, CIML-Marseille; C Hivroz, Inst. Curie-Paris; V Studer, IIN-Bordeaux; Alveole company. The current projects pursue investigations of crawling and guidance mechanisms of T lymphocytes. A general goal is to compare precise analysis of phenomena in controlled in vitro assays with physiological observations in vivo. Novel biological systems are investigated in collaboration with Marc Bajénof and Jean-Pierre Gorvel from CIML (Marseille)to explore the traffic of T lymphocytes in lymph nodes and in infected tissues (ANR Recrute 2015).